I can't believe I almost forgot about this wonderful ribbon card that Denise helped me make. I wasn't going to make it but she offered to sew the ribbon for me. A few posts back on the FABULOUS Tuxedo masculine card I mentioned how much I LOVE to sew!!! My sewing machine rarely sees daylight anymore. I took it out earlier this year to sew some papers together and after cleaning it up and oiling all of it's parts it didn't sew how I wanted it to so I put it back, closed the cover and put my Fiskars paper cutter on top of it again!! That is mostly what it is good for now is my paper cutting station!!! SO Denise sewing the ribbon meant a LOT to me!! 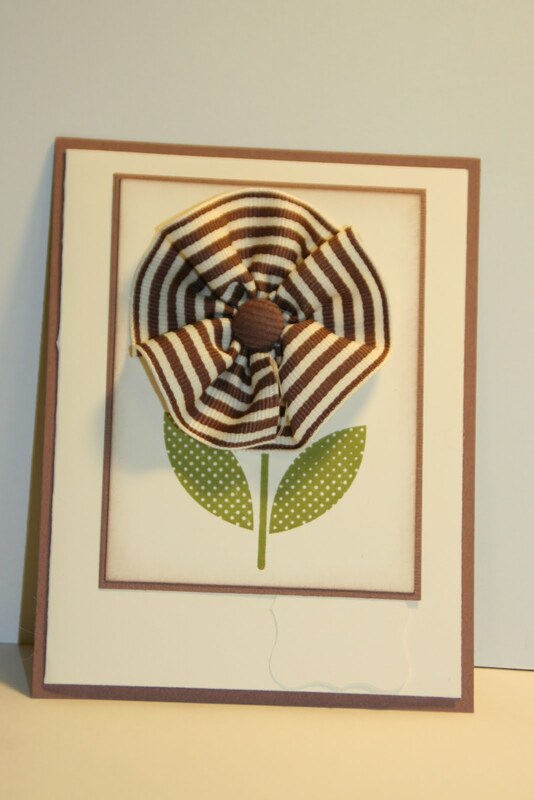 For this card, after the ribbon is gathered, the thread is tied off and a corduroy brad was put in the center. The Stampin' Up! "Sweetheart" set was used for the stem. They were stamped using Old Olive ink. If you click on the photo you will see to the right at the bottom is a label punched out waiting for verbiage. I didn't know what I wanted this card to say so I left it blank until I'm ready to use it. There is another option for words here and that is to remove that label and stamp the wording along the bottom. Either way will look GREAT! What I also like about this card that Denise designed is that it's just a quarter sheet of card stock for the back. The front piece (Very Vanilla) is folded in half and the two layers and flower are placed on top of that. 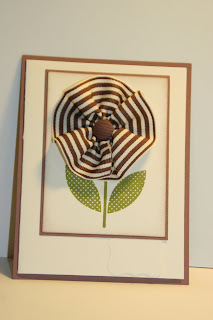 This is such a quick card to do too, quicker if you can get someone to sew your ribbon!!! LOL This would make a great birthday, get well, thinking of you and thank you card. It's a very versatile design. Isn't it just an adorable card? Thank you Denise, I LOVE it! And thanks again for sewing the ribbon for me. I'm SO spoiled! thats a realy good way to put texture to the card!! !